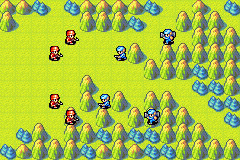 Basic troop movement and attack controls are explained here. Briefing: First, let me brief you on the situation. We’re in this large nation here, Orange Star. The country to the east is Blue Moon. The two countries have been bitter rivals for years. Border skirmishes had died recently… until that madman Olaf… Oh, excuse me. I mean, uhm… The Blue Moon CO, Olaf, suddenly ordered an invasion of Orange Star. So, the Alara region is now held by Blue Moon forces. Candidate Advisor, you have been given a mission. You are to drive Olaf from Alara and secure the region for Orange Star. I will be your support. Let’s move out! 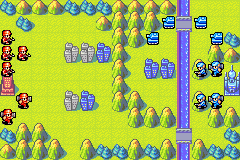 This mission is on defensive terrain cover. 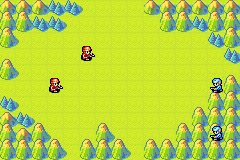 Briefing: Enemy forces have been spotted in the Alara Mountains. Their HQ is in another area, so we believe this is a covert attack. A covert attack… that sounds like something Olaf would try. 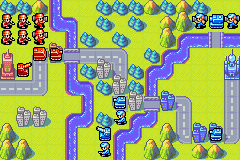 Your goal is to take out these units. 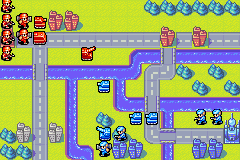 You’ve been given four Infantry units to carry out this operation. Let’s go! Capturing bases is the focus of this mission. Briefing: Our current mission is to storm the Spire Hills. If successful, we should be able to drive that pompous, old… I mean, we should be able to force the Blue Moon forces to withdraw. 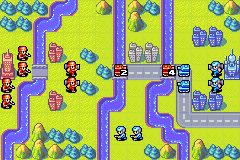 If you remember, we faced two mech units in the last battle, right? In response, you have been given command of two mech units yourself. This mission will explain the Join command and discuss basic strategy. Briefing: I think that creep Olaf… I mean CO Olaf is starting to take us seriously. But all of our commanders are caught up in other campaigns. So there’s no one available to lead the Orange Star Army against him. Advisor, it looks like it’s up to you to defend Orange Star. Let me brief you on the current mission. Our troops en route to the Lost Fortress have been waylaid by CO Olaf. It’s up to you to join up with them, beat back Olaf and secure the area. We need the Lost Fortress! Move out! This mission focuses on the Supply, Load, and Drop commands. Briefing: My superiors in Orange Star are pleased with your word, Advisor. I’m also happy to say the enemy troops aren’t deployed ahead of us. Look at this! An artillery unit has been assigned to your command! Used correctly, this unit will strengthen your battalion. No doubt about it. But, it sounds like it’s seen a lot of action on the front lines, and… Well, I guess we’ll get a look at it when we reach the battlefield. Oh, and I’ve received one more bit of information. You’ve also been given an APC unit to use. This one is fresh from the factory, so don’t worry about its condition. OK! Let’s get moving! This is a chance to show me what you’ve learned. Are you ready? Briefing: An entire company doing recon in the Coral Lagoon area has been lost. 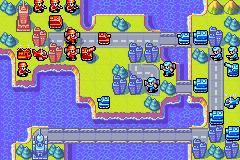 The Coral Fortress is surrounded by mountains, so it’s hard to imagine that there are many enemy units there. Still, an entire company it’s gone, so… The point is, we can’t afford to lose that territory. Time to get going! Mission 7 – Copter TacticsIt’s time to introduce air units. Briefing: It appears that we have a problem. Orange Star has hit a snag in its Md Tank development program. On the other hand, Blue Moon seems to have more than enough tanks… I think it’s safe to assume they have mass production capabilities. I pulled some strings and had some B copters and T copters sent down from the frontlines, but that doesn’t give you all that much firepower. Nevertheless, let’s make good use of them. I’ll give you more details once we reach the staging area. Let’s move out!